Hours after at least three new reports of sexual misconduct by high-profile men were published, CNN’s Alisyn Camerota hosted a powerful town hall conversation on sexual harassment in America. CNN’s decision to devote an hour of prime-time television news to lifting up survivor voices and engaging in thoughtful conversations with a live audience is commendable, and it’s the sort of thing viewers ought to see more often on cable news. 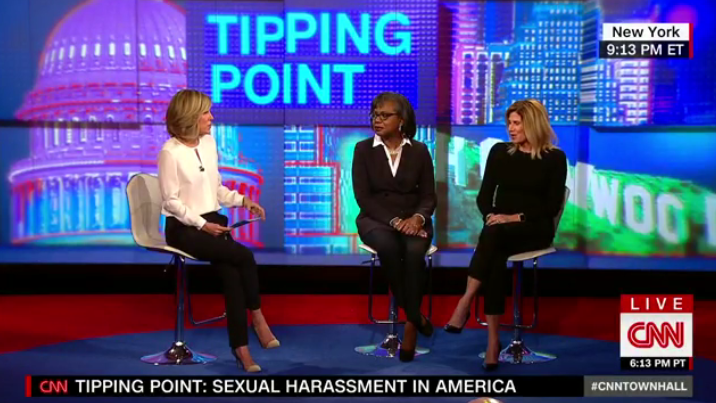 CNN’s town hall, titled Tipping Point: Sexual Harassment in America, was a model for the ways national news commentary can address a cultural moment by providing the public with facts and context, while also approaching a tough subject with responsibility and empathy. It began with discussions with law professor Anita Hill, actress Jessica Barth, former Fox News host Gretchen Carlson, and former Rep. Mary Bono (R-CA) -- all women who have reported sexual harassment by men in the public eye. ALISYN CAMEROTA: Why do you think that so many people are reluctant to now talk about this in this sort of public forum? JESSICA BARTH: It’s scary. I think there’s a lot of fear that comes with it, as what we just read about Harvey Weinstein and his ties with the [private intelligence firm] Black Cube. There’s a lot of fear. There’s shame with speaking out, and I think part of the process in moving forward is to try to alleviate that shame. I think women who have a story and need to speak out can look at the media right now -- I don’t know how it’s going to be in the future -- but right now it seems to be that the media is a powerful tool in getting justice and for these perpetrators to get consequences. CAMEROTA: Professor, from where you sit, 26 years later, after your testimony, do you feel like we’re at a tipping point right now? ANITA HILL: I absolutely do. You know, I’ve been in this for 26 years now, and I’ve seen stories come and go, and some of them are quite powerful. I’ve seen movements come and go, and some are quite powerful. I’ve not seen something like this. And I’m hoping that not only will it bring lasting change, but I’m really hoping in two areas, in particular, that change comes. One, that we start looking at how harassment and harassing behavior is enabled, and all the, really, structures and people who are complicit in making sure that harassment either continues or gets disguised. And that’s one of the things that we can clearly learn from the Harvey Weinstein story -- that every day there are revelations about who was helping him and who was covering it and who was being used to attack women who came forward to accuse. The other thing that I hope is that the believability factor gets transferred, and that it gets transferred to people, again, outside of Hollywood, but also to women who have been marginalized on this issue for years. Part of the response to me had to do with my race. There are people who are not believed, not because their stories aren’t true or credible, but because there’s a certain kind of skepticism that comes with all kinds of identity factors, whether it’s sexuality or race or class. And so we tend to think about Hollywood, and I want us to understand that this is -- sexual harassment, sexual assault is something that happens to women of all races, all ages, all sizes, all backgrounds, religions. And until we can believe all women, every woman’s voice has value, none of us, really, will be seen as equal. Hill’s words reflect the larger theme of the CNN town hall: Workplace sexual harassment is an all-too-common experience that transcends class, race, politics, and industries. For every woman like Gretchen Carlson or Anita Hill who was harassed by a powerful man and who spoke up and then lived through, in an incredibly public way, the world’s sometimes heartening and often heartbreaking reactions, there are countless other people whose painful stories will remain unheard. Camerota’s later conversations with Sen. Kirsten Gillibrand (D-NY), activist Tarana Burke (who started the #MeToo movement), and others drove home this point. Questions from audience members -- often activists, some who had experienced sexual harassment themselves -- also underscored this message. A town hall, rather than a multiperson panel of pundits, was a great public service to viewers, in particular those who may have experienced sexual harassment in the past. If one tuned in and didn’t see her experience reflected in Carlson, perhaps she would in Burke, or in an audience member. Or perhaps she would see herself in the moments of this town hall that felt like conversations I have every day with my friends -- moments in which Camerota and Carlson acknowledged their camaraderie as women who experienced harassment and silencing at Fox News. Or in which Gillibrand described an incident of harassment she’d experienced and the audience reacted with recognition and empathy. Or in which Camerota closed out the show by sharing one of her own sexual harassment experiences and bringing on stage the woman who helped her when she reported it -- moments for which I am particularly grateful as a woman and a survivor, as well as a media researcher. Tipping Point: Sexual Harassment in America may have itself illustrated a tipping point in media: a time when a major news network spends an hour of prime time listening to the voices of activists and survivors and mostly women. CNN's Brian Stelter: After Settling Five Harassment Lawsuits, Why Hasn't Fox News Fired Bill O’Reilly? Will Fox News Finally Take The Debt Ceiling Seriously? Since Republicans took control of the House of Representatives in 2011, Fox News personalities have urged them to use the threat of defaulting on the sovereign debt obligations of the United States government as a means of winning political concessions. With Republicans now in full control of Congress, will the talking heads at Fox finally come to terms with this monumental threat to the global economy and urge the GOP to raise the debt ceiling? O'Reilly: "I've Got A Kids Book That I Want Millions Of Kids To Look At. That's What I'm Interested In, Not Making My Network Look Bad." BILL O'REILLY: I want to be very candid here, I'm not that interested in this. O'REILLY: No, I mean, it’s over for me. NORAH O’DONNELL (CO-HOST): In sexual harassment? You’re not interested in sexual harassment? ​O'REILLY: I’m not interested in basically litigating something that is finished, that makes my network look bad. OK? I'm not interested in making my network look bad. At all. That doesn't interest me one bit. O'DONNELL: Is that what she's doing? ​O'REILLY: I don’t know, but I’m not going to even bother with it. I've got a country that's in a transition, political transition. All right? I've got a kids book that I want millions of kids to look at. That's what I'm interested in, not making my network look bad. O’REILLY: Look, it's open season, let's whack the Fox News Channel. I've had enough of it. It's a good place to work, all right? We do good work. We do honest work there. So, I'm not going to buy into let’s use the Fox News Channel as a piñata. I don’t think it’s right. O’Reilly was one of many Fox personalities who defended Ailes in the wake of a sexual harassment lawsuit filed by former host Gretchen Carlson in July, saying in an interview, “I stand behind Roger 100 percent,” and calling Carlson’s lawsuit “frivolous.” After Ailes resigned amid building public pressure, O’Reilly falsely claimed that he hadn’t commented on the sexual harassment claims against Ailes. Since Ailes’ resignation, it has become clear that sexual harassment is an institutional problem at the network. Kelly was one of over two dozen women who came forward after Carlson filed her lawsuit alleging that they had been harassed by Ailes. Former host Andrea Tantaros also filed a sexual harassment lawsuit, naming not only Ailes, but several high-level executives and the Fox News Channel as defendants. Tantaros claimed that her “tenure at Fox News devolved into a nightmare of sexual harassment by Ailes, Fox News’s then-President, and others, followed by retaliation by Ailes and others despite multiple ongoing complaints by Tantaros.” One of the Fox executives named as a defendant in Tantaros’ suit was Bill Shine, who, according to the lawsuit, responded to Tantaros’ complaint that she was being harassed by telling her “that Ailes was a ‘very powerful man’ and that Tantaros ‘needed to let this one go.’” Shine was promoted to co-president of Fox News after Ailes’ resignation. Will Fox News Let Megyn Kelly Discuss Her Allegations Against Roger Ailes On-Air? While promoting the release of her upcoming memoir on her Fox News show, Megyn Kelly has remained silent on her reported allegations in the book that she was sexually harassed and assaulted by network founder and former CEO Roger Ailes. This raises questions about whether the network will allow Kelly to discuss these allegations on their airwaves. During the November 3 edition of her Fox News show, Kelly noted a last-minute revision she made to her forthcoming autobiography, Settle For More, about former Congressman Anthony Weiner, who is currently under investigation for an alleged inappropriate relationship with an underage girl. She also highlighted the “many contentious exchanges” with Weiner throughout her time as a Fox News host. Kelly claims in the book that he started to harass her, too, in the summer of 2005, a few months after she was hired as a legal correspondent in Fox’s Washington bureau. She writes that she was informed by her managing editor that she’d “captured the attention of Mr. Ailes” and she was summoned to the first of a series of meetings in his Manhattan office. The Wall Street Journal, Fox News' corporate cousin, confirmed Radar Online's report. Roger Ailes, the former chairman and CEO of Fox News, resigned his position at Fox following allegations from multiple women of sexual harassment and assault by the executive. Former host Gretchen Carlson first accused Ailes of “sexual harassment/retaliation” in a lawsuit after being abruptly fired by the network. 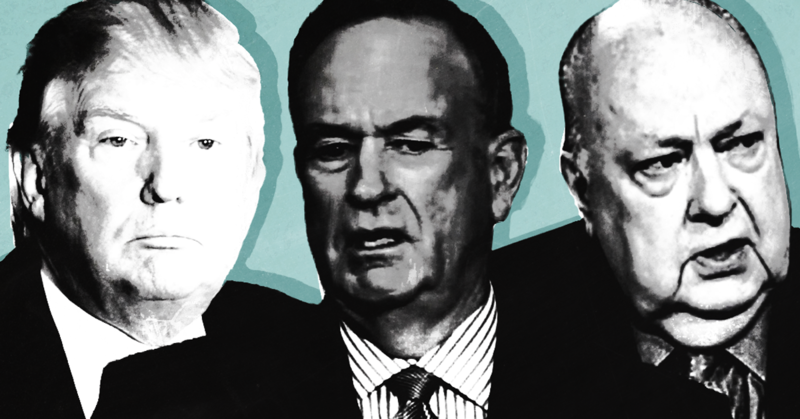 Dozens of women have since accused Ailes of similar harassment, including Kelly. While these claims have been widely reported by the media, Fox has remained mostly silent about the reports of harassment on their airwaves, which speaks to the culture of sexism and misogyny at the network. Media should report on the immense hypocrisy of Republican presidential nominee Donald Trump levying attacks on former President Bill Clinton’s history with women and Democratic nominee Hillary Clinton’s responses to those women.Trump and several of his closest advisers have long histories of engaging in infidelity, workplace sexual harassment, and misogynistic behavior. Trump himself has also called Clinton’s relationship with Monica Lewinsky “totally unimportant,” and, The Washington Post reported, he “repeatedly dismissed and at times mocked” the women who have accused Bill Clinton. Fox News Channel, which launched on October 7, 1996, celebrated its 20th anniversary Friday and mentioned the occasion on at least seven different news shows throughout the day. The anniversary tributes included a video featuring two top executives, but notably neglected to mention Fox News founder Roger Ailes. The former Fox executive was recently ousted from the network due to multiple claims of sexual harassment from female colleagues and subordinates over many years. Ailes is currently advising Republican presidential nominee Donald Trump, whose candidacy is now in crisis over a 2005 recording of the nominee boasting about sexual assault that was coincidentally released by The Washington Post on Fox News’ anniversary date. This took some doing: 21st Century Fox is celebrating the 20th anniversary of Fox News without even mentioning the founder of Fox News, Roger Ailes. The tribute appears on the website of 21st Century Fox, the cable news network’s parent company, and includes a brief video in which Lachlan Murdoch and Rupert Murdoch, top executives of the company, look back on the world-beating organization that Ailes launched in 1996. Bolding added to highlight what has to be a reference to Ailes, the now-76-year-old Republican strategist-turned-television executive who drove Fox News programming decisions with resourcefulness, ruthlessness and shamelessness. 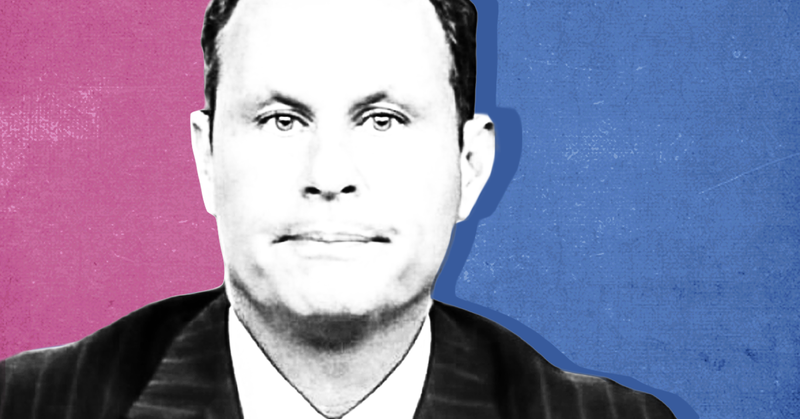 Despite Fox’s best efforts to hush the news around Ailes’ misconduct, the outlet’s own history of hate, misogyny, and smears speaks volumes about its forgotten creator. Fox Business devoted a mere 16 seconds of airtime to the eight-figured settlement reached by 21st Century Fox and former Fox anchor Gretchen Carlson after she filed a lawsuit against former Fox News CEO Roger Ailes for sexual harassment and retaliation. Bloomberg and CNBC spent marginally more time on the news, even though Bloomberg relegated the story to quick headlines. In the 24 hours after the settlement was announced, Fox Business covered it only once, in a 16-second statement from host Charles Payne. Bloomberg News devoted six segments to the settlement, but they were all short headlines that lasted less than 30 seconds each. Fox News was also hesitant to cover the story when Carlson filed the lawsuit in July, and when the network did report on the issue, it leaned heavily on Ailes’ prepared statement. The network’s first report on the lawsuit came a day after it was filed, and it was almost entirely a recitation of Ailes’ statement. In a piece on FoxNews.com after news of the lawsuit broke, Fox News media analyst Howard Kurtz carried water for Ailes by citing his denial before even establishing the facts about the allegations he was denying.